Maybe, when you were younger, getting hold of high-quality ski gear was an easy process. Your parents rented the equipment and ski clothing for you, or maybe you had some ski boots passed down from an older sibling. It was as simple as putting on the first pair of boots that fit. But now you’re shopping for a pair of ski boots yourself, or just looking around and what’s what. So, how do you buy the best men’s ski boots? There are colors, shapes, attachments, straps, bindings, and different qualities of boots. And the only thing you remember about your former ski boots is that they always felt better coming off than going on. We hope to provide you with enough insight to make a good choice. Putting on your ski boots should be something you look forward to, not something you dread. So far we’ve looked at the best men’s ski pants, ski jackets for men and men’s ski gloves. Now let’s jump in and take a look at what you should be looking for when buying ski boots. It is true that there is no better feeling than pulling off your ski boots after a hard day on the slopes. But that doesn’t mean that your boots shouldn’t be comfortable for you to wear. Just like any other item of ski clothing. You should love the experience of slipping on a pair of ski boots and getting a perfect fit for both you and your skis every time. With a few easy tricks and a bit of information, you will be able to make a sound choice and to be happy with whichever ski boots you pick. Once you’re done, you’ll be able to get the right boot for your skill level, your style, and your skis. It’s not rocket science, and you’ll be an expert in no time. This guide will cover getting men’s ski boots that offer support as well as comfort, picking a boot perfect for your skill level, and choosing among the features that you need (and the ones you don’t) for a great ride. 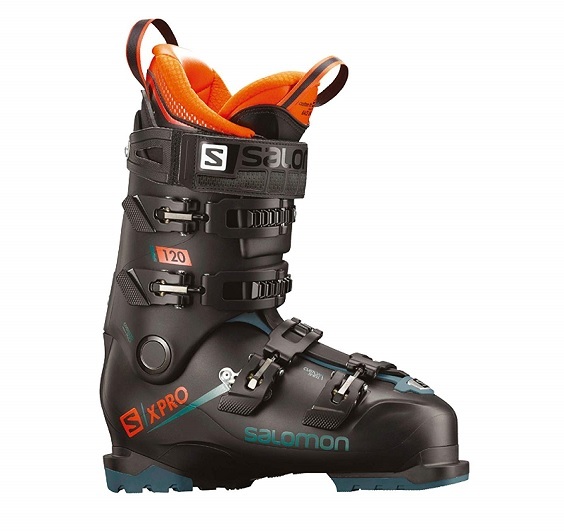 Here is a quick guide to some of the options available online for ski boots. Remember: the best ski boot isn’t the one that is the most expensive, the one that your neighbors swear by, or the ones in the ski boots sale. The best men’s ski boot is the one that fits your foot and your skiing style. The rest is just fluff and glitter, so to speak. This brand is well known for producing some of the year’s top performers in ski boots. The whole boot has been designed so that it can conform to your foot. The shell and the liner are easy to put on, and the buckling system makes it perfect to adjust to your foot. The buckles are designed to be customizable so that it’s easier to make it your own. This boot doesn’t weigh a lot either, making it a good choice as an all-rounder boot. To get a precise fit, this boot offers you the best options. It allows you to pick and choose the fit according to your needs. The comfortable liner gives extra padding and the shell can be heat-molded to your foot for additional support and transfer power. The rubber soles also make it perfect for walking while also making it comfortable to ride. The boot has good width and an excellent buckling system. As an introduction to skiing, this boot is a great way to get into the sport. It’s not the most technically advanced, but it does make the sport much more affordable to try. 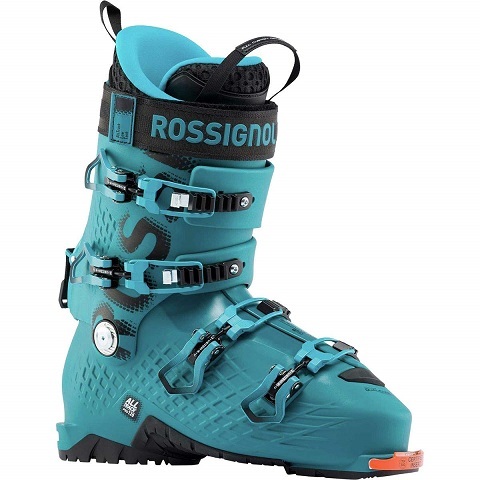 The Rossignol brand is synonymous with skiing, and so they’ve put out a boot that helps novices get into the sport as well as catering for more advanced riders. The liners and shell make for a comfortable and warm hold on your foot. It has even won awards for being one of the best in 2017 for men’s ski boots. For those who aren’t aware, Lange actually introduced the plastic boot shell over 50 years ago, and they’ve been keeping on top of the market ever since. 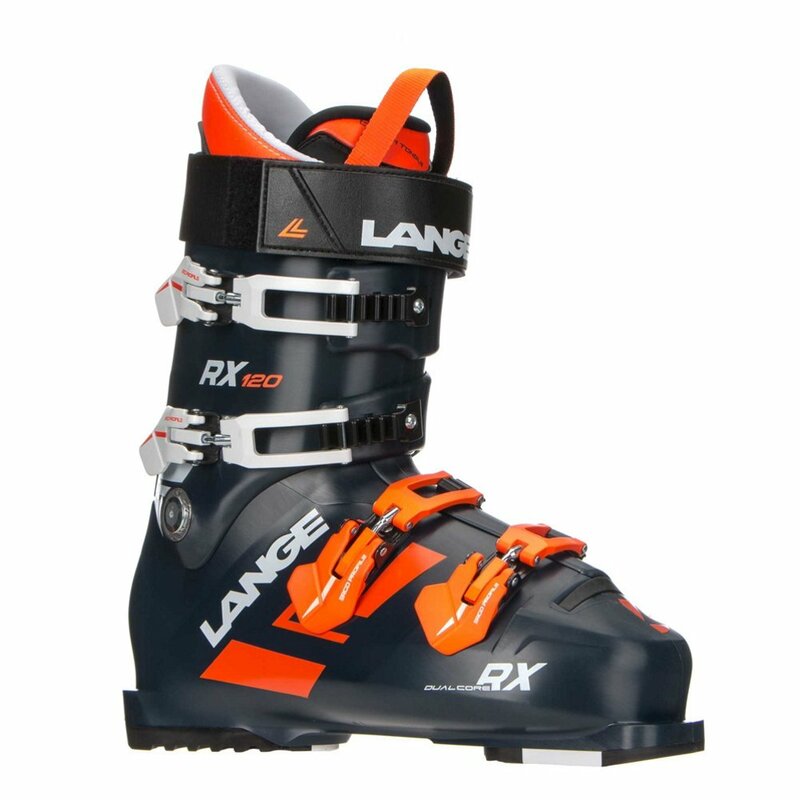 This boot is often rated online as the best men’s ski boot you can buy. That’s because it comes with just about everything you need for all your ski days. It boasts of a comfortable liner, a shell that can be molded to your foot and a buckle system that doesn’t let you down. The Lange RX 120 also a very stiff feel. That doesn’t do much for you when you’re walking, but that doesn’t translate into a smoother, cleaner ride. The boots are practically extensions of your legs, once they’ve been perfectly fitted. They’re durable, warm, perform excellently on downhill slopes of every difficulty, and they are a top choice for professionals who understand what they expect from their ski boot. If you were to compare men’s ski boots from 50 years ago with current ski boots, you’ll notice that today’s boots come with many more bells and whistles. Boots have all these different features that you should at least be able to grasp the concept before buying your first pair. The best boot is the one that caters to your skill and ability. Whether you plan on simple cross-country tracks or you want to attack the moguls on the double black diamond runs aggressively, you need the right pair of boot. One, it should provide a good amount of warmth. Being out in the snow all day can be taxing, and there’s nothing that will slow your day down faster than a cold foot. Warm feet means that you can enjoy the day longer and go farther. Men, your ski boots should give you good support. A stiff boot is best for supporting your feet on skis. Strapping long slippery boards to your feet is a challenge to manage, and if you don’t have good support on your main foot, you’re leaving yourself open to getting into an accident. Support your feet by getting a boot that keeps everything in place all the way down the hill. And three, your boot should not hinder your ride. The best men’s ski boots offer good transfer. That means that the power and turns in your legs are effectively transferred to your skies. You need as much control on the slopes as possible. By not losing any turning motions through the transfer from leg to ski, your boot helps you last longer on the slopes and stay safer. If this guide – or any guide to men’s ski boots – didn’t mention ski socks, it wouldn’t be doing you a service. You should be aware that there are purpose-built ski socks for men that add to your experience and comfort. If you’re going to get serious about skiing, be sure that when you try your boots on that you’re wearing ski socks – preferably the socks you’ll be using on the slopes. Ski socks are designed for the rigors of tough riding. They wick away moisture from your foot, keep your foot compressed for better comfort, they don’t slip inside the boot, and are durable for the harder use they get put through. Be sure to find a pair with a good warranty. It does feel weird finding a warranty on socks, but the result is worthwhile. Try finding a pair of ski socks like this one here. Now that you’re ready to pick a boot that has warmth, support, and power transfer, you’ll notice a range of features on your boot. Let’s look at each feature, and how they’re going to add to one of those main purposes of the ski boot. Of course, each boot should come equipped with a proper liner. Remember when you put on those old rental ski boots, and part of your foot was rubbing against the boot shell through the thin liner? Pick a boot that has a liner that is thick enough to comfort and warm your foot. The best men’s ski boot liners come with thermoformable liners. The liner is heat-molded to your foot to give you an exact fit. Also, a good liner should come with the option of adding additional cushioning. If you’re a beginner skier, you probably would feel more comfortable with a padded liner. Experienced skiers tend to prefer thinner liners that increase control. Check the soles of the boot you’re about to buy. Most men’s ski boots use a hard plastic or a rubber sole. A sign that you have a good pair is that they’re fitted to have both. Soft soles work if you’re going to be walking or doing some simple ski touring. Hard plastic soles need to securely fit into the ski’s bindings. Watch for a sole that won’t wear away. A soft rubber sole will slowly wear down, reducing the contact on the ski, and therefore losing control in the fitting of the ski. To get a better fit (and therefore more comfortable), your boots should be equipped with a good number of buckles. Each buckle tightens over a specific part of your foot. You should have a couple of buckles to tighten over the top of your foot, your shin and around the back. The number of buckles doesn’t make the boot. You need to be aware of where the buckles are rather than how many it has. Also, make sure that your buckle can lock into place easily. There’s nothing worse than heading down a ski slope and having a loose buckle undo a perfect run. Take care to have a strong and secure buckle. Some ski boots come in, what’s commonly called, a walk or ride mode. You can alternate your boot’s feel depending on if you’re walking around or you’re riding on the skis. This is more for experienced riders who will be walking in the backcountry or doing a lot of uphill hiking to get to better trails. This simply allows your foot to alternate between a stiff feel for riding and a relaxed feel for getting the right foot motion. Stiff boots are harder to walk in, so to protect your foot for a long day a walking mode makes it that much easier to get to your next run. The power strap is a band that sits on the top of the boot. 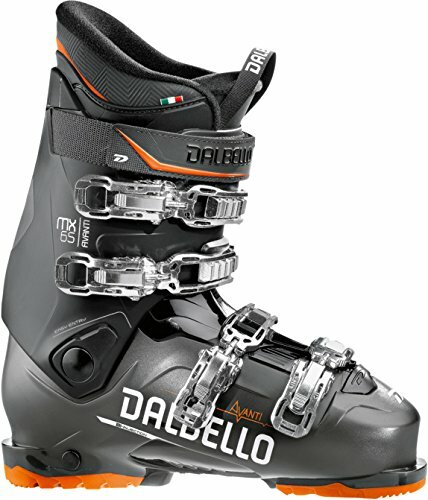 It is a recent addition to ski boot technology, but now is a pretty common feature on most of the best men’s ski boots. The power strap pulls the top of your leg in tight against the boot. When your power strap is on correctly, you should have no play between your leg and your boot. The less movement between boot and leg, the more control you’ll have when skiing. That transfer of power makes a big difference to the power you have to stop, slow down, turn, and make tight maneuvers around obstacles (or other skiers). We’d recommend finding a boot with a power band to keep you more in control on the slopes. Another option you’ll come across in many boots is the rear spoiler addition. It’s a wedge that sits in between your calf muscle and the rear of the shell. The purpose of this wedge is to increase the forward lean on your skis. It also can be used to reduce shin pain. If your boot causes your shins to ache, it could be because you need a slight adjustment in where your foot sits in the boot. The advanced rear spoiler option is one life-saver that some, more advanced, skiers swear by. 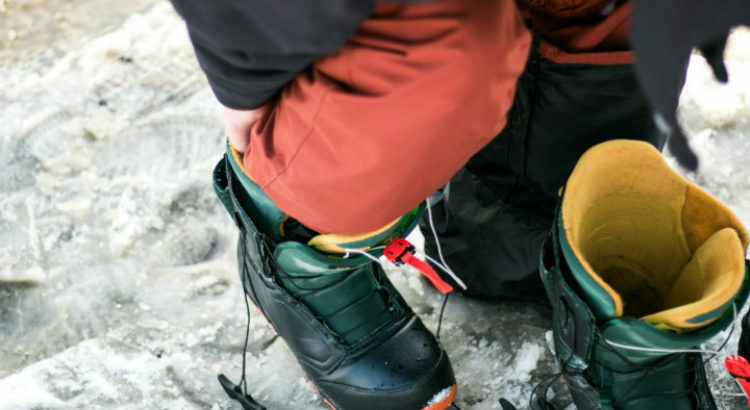 This guide to men’s ski boots is meant for the novice skier. More advanced boot features can also include options like landing shocks for hard riding, adjustable fit options as well as alpine touring features. Allow for a brief diversion on the topic to talk about bindings. They matter a great deal to your overall experience, and about picking the right boot. Your boot should cater to your skill level. Make sure that when selecting a boot that you get advice from a profession boot fitter. They can assess your skill level, look at your height and weight and decide based on that. You know you’ve found a good fitter if you get peppered with questions about your skill level, your riding locations, and other skis. The boot that you buy will have to be fitted to your skis. That fitting is very important. One of the keys to a great (and safe) ride is the DIN number. This is the setting applied to your ski’s bindings that determines when your fitting will release your boot. Higher DINs mean more resistance to a release. Lower DINs are meant for beginners and will release upon impact. Never set your own DIN number, but let the professional set the level according to your level and skiing ability. It used to be that people with wide feet need to move up a boot size to get boots that would fit their feet. That isn’t the case anymore, and things changed when manufacturers began to introduce the “last size” of the boot. The last size is a measure of the horizontal width of your foot. The most typical boots fall into the last size of 100mm. That should accommodate just about everybody. Beyond that, there are a couple of options available online for good ski boots for wide feet. The Lange RX 130 and the Salomon X-Pro 120 compete against each other as the better option that you can find online. They are designed to suit wider feet without compromising on weight or power transfer. They don’t allow for movement in the foot, but they do accommodate wider feet. Don’t get bogged down by color and style. Don’t get sucked into discussions about design and brand with friends and family who also ski. And don’t sacrifice you ski boot for the sake of buying something that might not be the best option for you. Stick to picking features on your boot that you need and that suit your skill level. You should invest in a better ski boot that will give you a better ride on the slopes. You’ll thrive in a good pair of men’s ski boots, and your ability will certainly benefit due to your foresight in buying the best ski boots for men.